Mrs. Cornelius taught at the Pinewoods Camp for dance and music in Plymouth. 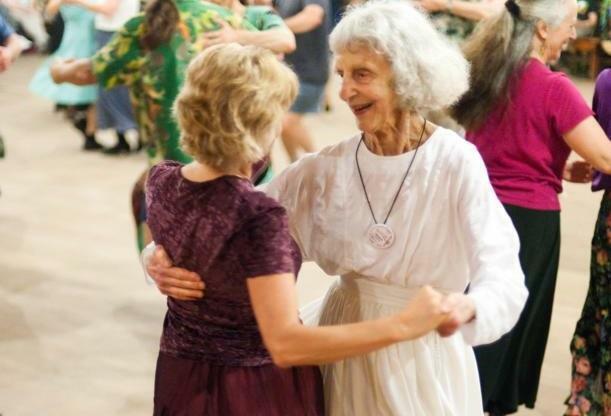 For more than 60 years, Helene Cornelius danced around the country, becoming nationally and internationally known as an authoritative teacher of English country dance who would not hesitate to introduce new routines. Mrs. Cornelius died May 3 in Beth Israel Deaconess Medical Center of a brain injury suffered in a fall. She was 87 and lived in Arlington. Foster met Mrs. Cornelius in 1971 during his first trip to the Pinewoods Camp for dance and music in Plymouth, where she and her husband taught. He had traveled there with some other California teenagers. The oldest of four children, Helene Valeska Thoman was born in Cincinnati and was close to her maternal grandmother, after whom she was named. She played the piano, Ping-Pong, and tennis during frequent visits to her grandmother’s house and accompanied her to the opera. At what was then Hillsdale School in Cincinnati, she excelled in math, and during summer breaks she worked as a nurse’s aide at a hospital. She graduated from Smith College with a bachelor’s degree in math in 1946. Two years later, she received a master’s in math from Radcliffe College. While studying for her master’s, she worked on Long Island in New York as an engineering aide for the company that now is Northrop Grumman Corp.
After completing her degree, she worked in a Harvard laboratory on a project developing an early version of a computer. In 1951, Harvard co-workers invited her to a dance in Boston. There she met Arthur Cornelius of South Boston. They married the next year. “I believe my parents’ marriage was a strong one that endured for 60 years because they allowed each other the freedom to pursue their own interests while always sharing a common love of traditional English dance and music,” said their daughter Lynn Cornelius Jacobs of Belmont. Her brother David of Rossland, British Columbia, said their parents complemented each other. Mrs. Cornelius and her husband, who died last year, sometimes invited friends to their home to sing. Lynn described those occasions as social and seriously musical. At age 72, she hiked with her son up Half Dome at Yosemite National Park in California, an excursion she trained for “by walking briskly up the hilly streets in Arlington with a knapsack loaded with books,” he said. In addition to her son and daughter, Mrs. Cornelius leaves another daughter, Karen of Madison, Wis.; another son, Peter of Old Lyme, Conn.; two brothers, John Thoman of Rochester, N.Y., and Mark Thoman of Glen Ridge, N.J.; and three grandchildren. A memorial dance in her honor will be held at 7 p.m. Sept. 21 in Nevins Hall in Framingham.